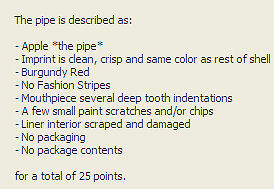 The value of pipe #384 is 25 points. Noah B. Williams offered two pipes on eBay. This one is new to the collection so it goes to the Table of Colors and Shapes of the pipe page. A slightly better example came along, so this one becomes a Pipe for Trade. Larry Arnold is building his collection as well as his smoking rotation and added this pipe to his herd.